Jimi Hendrix's cultural impact on New York's Greenwich Village is immeasurable. For almost 50 years, music's most celebrated recordings have been produced right here on West 8th Street at Electric Lady Studios - the facility Hendrix himself created in 1970. From Patti Smith, Stevie Wonder, David Bowie, and The Rolling Stones to Lorde, Frank Ocean, St. Vincent and Adele, Hendrix's inspiration and influence is still felt to this day. 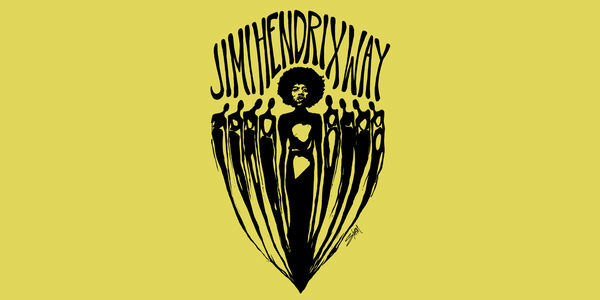 Today neighbors and organizers are coming together to pay tribute to Jimi's unmatched contribution to creativity, self-expression, and to our local community by co-naming West 8th Street "Jimi Hendrix Way." Collaborators Storm Ritter of Storm Ritter Studio, Richard Geist of Uncle Sam's Army Navy Outfitters - supportive community members (including 8th street residents, Rob Key and Shaolin), and members of The Village Alliance are creating a path to a fitting tribute. Please join by signing the petition below.